Update: This was originally posted just for our supporters, but now it’s available for everyone. Enjoy! Since Ion Hazzikostas, World of Warcraft’s Game Director, brought up the subject of leveling in the game and how it might change I’ve been thinking about it. We did a post about the level squish proposal and I was frankly surprised at how many players seemed openly hostile to the idea. Being that I didn’t want to just ignore that sentiment and because I’ve been leveling a Kul Tiran Warrior to get their armor (and because it’s the closest I’ve gotten yet to playable Vrykul in WoW) I’ve been paying attention to how fast leveling has gone for me, what I’ve noticed while doing quests, running dungeons and otherwise getting from 20 to 75, my current level. And I do see ways to improve leveling without actually squishing levels. They may not address all the concerns people have with leveling — they won’t make every single level we get feel meaningful the way they used to back when we got a talent point every single level from 10 to 60, for example — but they’ll allow for more freedom and choice and give players more control over what they do. So here goes with my completely subjective ideas for how to fix leveling without a level squish. We haven’t really had a new talent tier added in a while — not since Warlords of Draenor if I’m not mistaken — and the way talents are distributed now, you get one every 15 levels until you hit level 90, upon which you get the final talent tier at level 100. Since we’re leveling to 120 as of Battle for Azeroth, that means you go 20 levels, two whole expansions, without a new talent of any kind. Now, both the Artifact in Legion and Azerite Armor in Battle are supposed to replace talents to an extent. But the fact is, with us at 120 levels, it would make sense to add a new talent tier and change when you get talents to take advantage of all those levels full of what is, essentially, nothing much happening. It would make sense to get our first talent at level 10, and if we did it that way and got a talent tier every 15 levels (as it works now) we’d get new talents at 25, 40, 55, 70, 85, and 100. Then, if we wanted to add a new talent in the next expansion (as I’d argue we’re long overdue) we could get it at level 120. We moved away from getting a talent point for every level for good reason — it led to some very unpleasant situations where people would end up with a 5 point talent that was just 1% crit per point spent, and in general I think talents are vastly improved now. But they’re also somewhat stagnant, and a rebalancing pass followed by a new talent tier would overall shake them up and help them feel fresher. Leveling through Azeroth, I almost immediately noticed that I enjoyed being able to choose through a variety of zones, and that I enjoyed not having to be as concerned that I would outlevel those zones. But I still did outlevel them — by level 55 it became apparent that I wouldn’t even explore a third of Azeroth before I was past the level 60 cap on old world content, and would be forced to move on to Northrend and Outland. Now, at level 75, I haven’t finished Borean Tundra or Hellfire Peninsula, the two starting zones I’ve been exploring since level 60. In five levels, those zones will stop scaling and I’ll be forced to move on to Cataclysm and Pandaria zones. I don’t mind that certain zones require you to be at least X level (such as Borean Tundra requiring level 58) to go explore them. But I do mind that eventually, even if you’re interested in exploring the rest of Northrend, you’ll have to move on. The scaling system works well, but it’s too conservatively applied. It’s there because players didn’t want to find their max level character going back to vanilla zones and actually having to pay attention to how hard the mobs hit because that ruins the power fantasy of being a max level character. 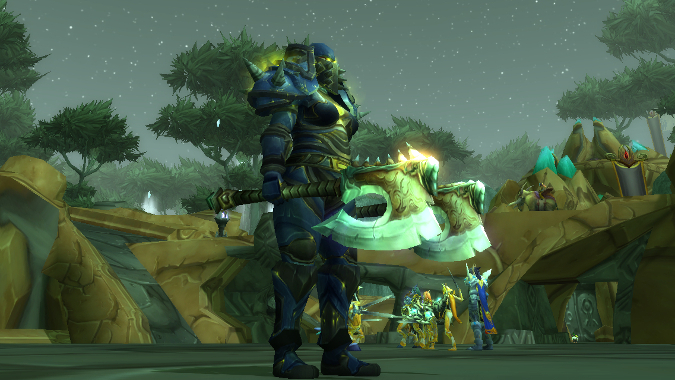 So imagine if instead all zones from classic up to Warlords of Draenor scaled to 100. 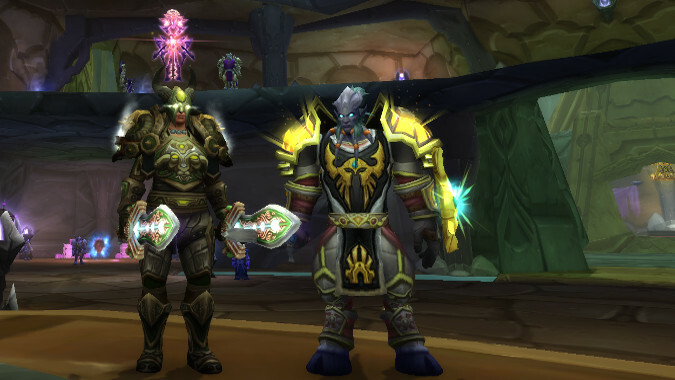 And when we got into the next expansion after Battle for Azeroth, the new scaling level cap moved up to 110, and Legion went into the scaling rotation. You’d only outlevel leveling content when you were close to max level and likely pursuing that content, and max level characters would still be able to go back to pretty much any zone and annihilate anything in it. Meanwhile, while leveling up, you’d never have to decide to leave content you were enjoying to play elsewhere. However, one change I know people won’t like would be required, in my opinion. Heirlooms were a good idea when they were implemented, but nowadays they’re just exacerbating a problem that didn’t exist when World of Warcraft came out. 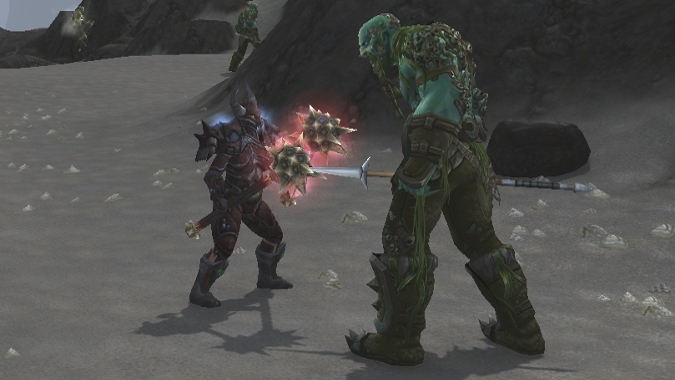 Yes, it’s true that leveling feels less meaningful when you don’t get new abilities or talents, but as much as we might pretend otherwise WoW is a game about getting new gear and loot. Running a dungeon on a level 72 character shouldn’t end up with you vendoring everything because nothing is as good as your heirlooms because those will level up as you do and give you a big XP boost in the process. If we want leveling to be faster, just make it faster. If we want leveling to be meaningful at the same speed it’s at now, just bake that extra 50% or so XP from full heirlooms into the amount of XP we get every level and go back to gear from quests, boss drops and other sources being useful for more than just filling out an appearance bank for transmog. Getting weapons shouldn’t be meaningless. Getting armor and necklaces and rings and trinkets should all be exciting, it should be part of the good feeling someone has as they level up. I realize that people have spent a lot of gold on heirlooms. I know this because I’ve spent a lot of gold on them. And in a way I almost think they should be expanded to some extent — but I also think that expansion shouldn’t come with them getting more levels and scaling, but more appearances. 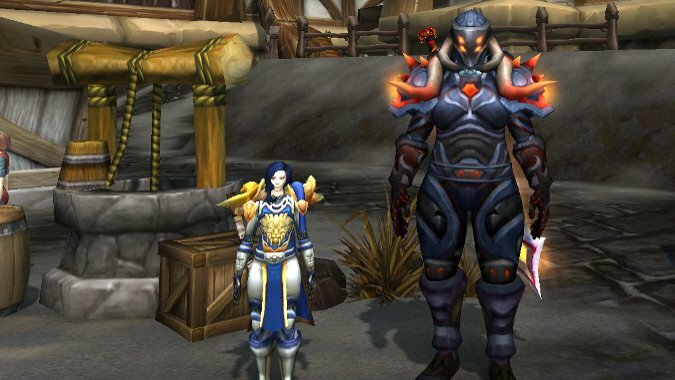 Heirlooms should be a way for people to pick up appearances they’re not likely to get anymore, either because they’ve been removed or because no one is running that content, similar to how Timewalking works now. Leave the pieces in the game, let people spend money to get those appearances, and make it so we actually want gear upgrades again. I have other ideas — like considering doing expansions that don’t add levels to the game or just add 5 levels to keep the level inflation down, for example. But we’ve nattered on long enough, and I’m curious about your ideas. What would you do to make leveling feel better while keeping levels as they are?